This is a 6 pc complete kit for use on 1969 - 1981 Camaro and Trans Am Models. These are new replacement pedal pads, and accent trims for use on 69 - 81 models with automatic transmission. 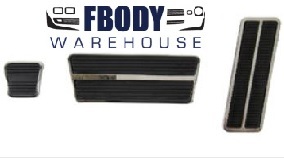 Pedal pad and trim kit includes all our same high quality pedal pads and matching polished stainless trim. Trim will fit all applications although may not be original for the application. Nice addition to brighten up those plain black pedals.